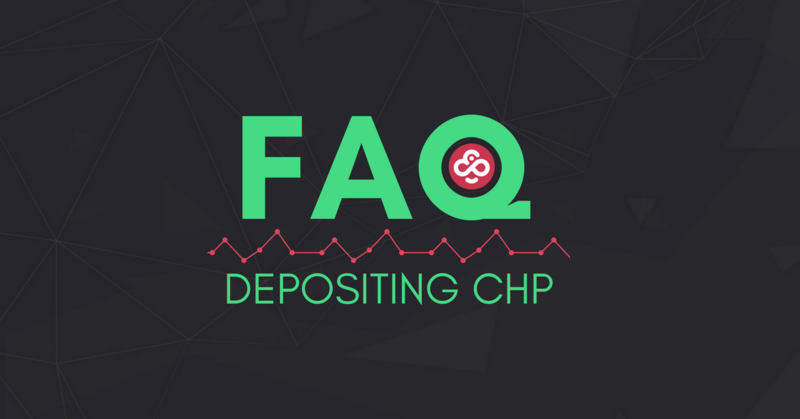 [FAQ] How Do I Send CHP Tokens to My CoinPoker Account? 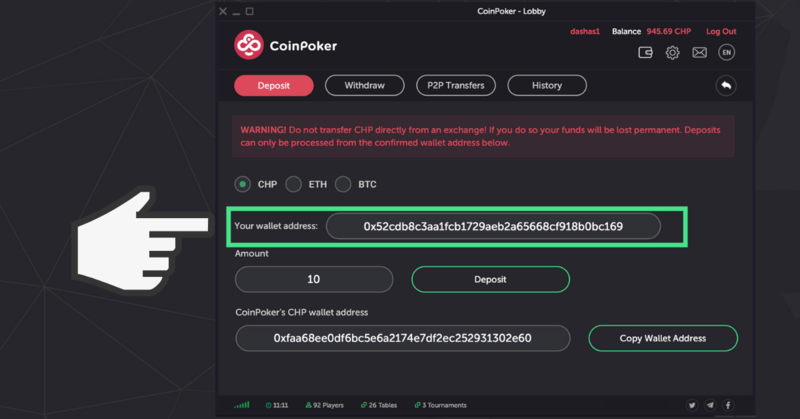 For someone a little less familiar with cryptocurrency transfers and transactions, your first CoinPoker deposit may be a little tricky. To help you out, we’ve outlined the steps you need to take to do this easily and securely. 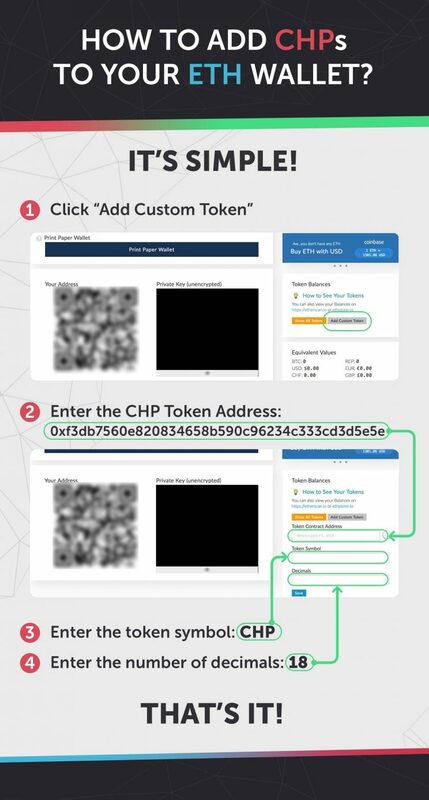 If you still want to buy CHP tokens you’ll find all the steps you need to do that outlined below. One important thing to note is that none of these exchanges allow you to purchase ETH or BTC using fiat currency, meaning that unless you already own cryptocurrency you need to acquire it elsewhere. Some options for exchanges where you can purchase cryptocurrency using a credit card are Coinbase and Kraken. For most sites the action is the same: search the coin listings for CHP and hit purchase. 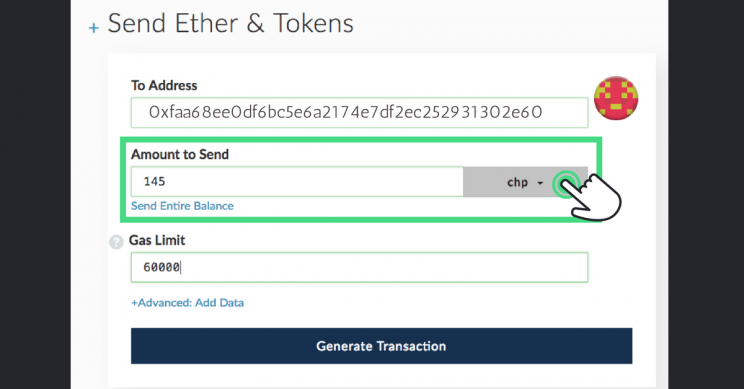 Note that you do need to buy ETH or BTC first, and once you have them they need to be transferred to your selected exchange before buying CHP. If you need help getting an account at any of these exchanges, make sure you get in touch with their support teams or do a quick YouTube search for “How to purchase BTC/ETH on…”. There are plenty of resources out there thanks to a super active and growing crypto community of content creators. What crypto wallet should I use for my CHP? 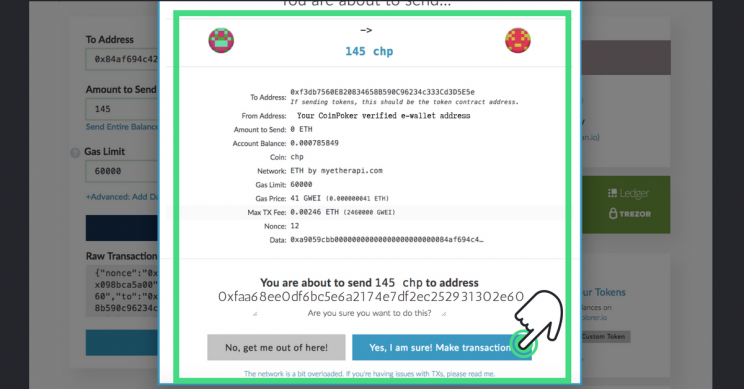 Once you go through these you will not only understand how CHP works, but you’ll be able to choose the safest and most convenient wallet for your tokens (CHP included!). 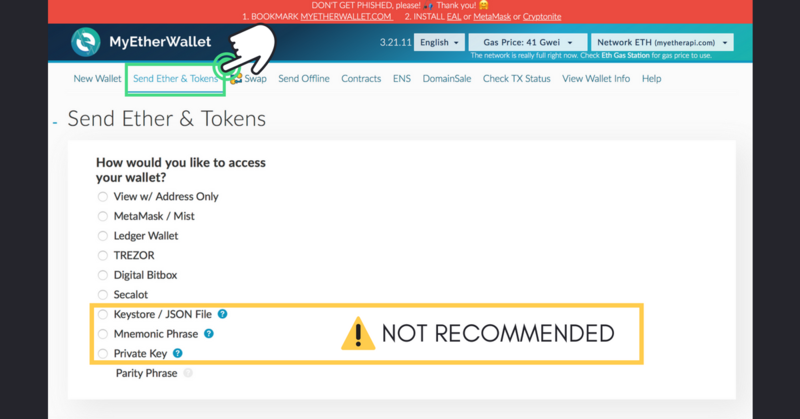 VERY IMPORTANT: DO NOT DEPOSIT TO COINPOKER FROM AN EXCHANGE! Never transfer CHP tokens directly from an exchange to your CoinPoker account. This is because exchanges hold the funds of all their users in a collective wallet address, and when you do this it is impossible to know who or where the deposit is coming from. You need to transfer the tokens to your ERC-20 wallet first, which should then be confirmed on your CoinPoker account which we will get into next. If you happen to change your wallet or want a new one, you can send an email to [email protected] and we will amend it for you. BTC deposits will work a little differently, which we’ll explain next. 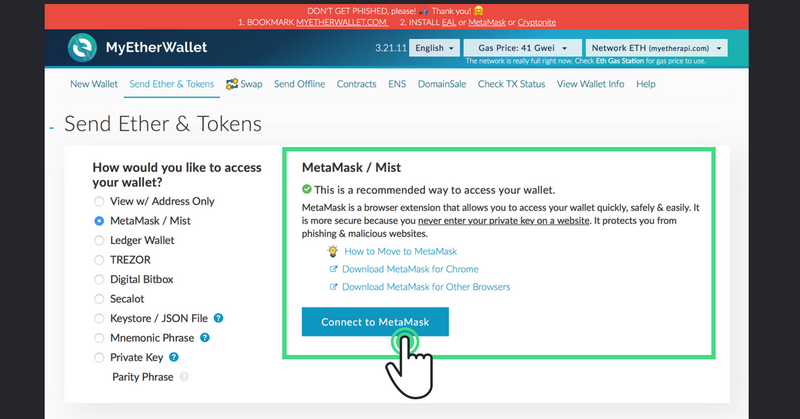 Step #7: Transfer CHP from Your Verified Wallet to Your Account and Play! 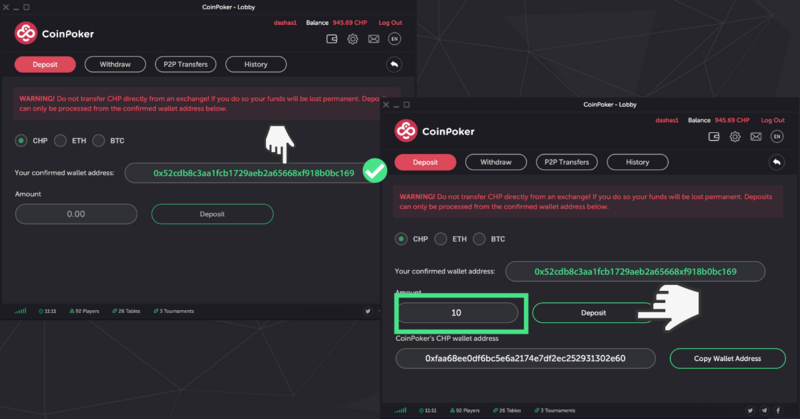 All that’s left is completing the transfer to your CoinPoker wallet address, and depending on the speed of the Ethereum network your deposit will be credited and you can start hitting the tables! 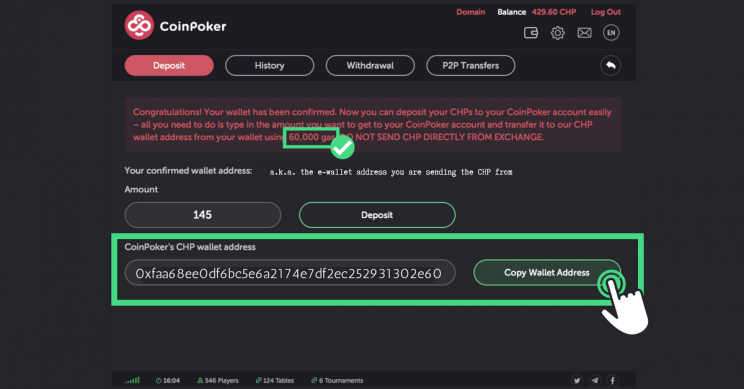 If any of these steps are confusing, or if you experience any issues while completing your CHP deposits on CoinPoker please get in touch with our support team. You can do this on our official Telegram channel, or by sending an email with the following details to [email protected].